From stages big and small, here are fan favourites, critical darlings, and local heroes playing in Ottawa in the coming weeks. Looking for places to spend your beer money? Here’s what’s coming to town. January 16: DJ Nu-Mark of Jurassic 5 plays a DJ set of favourites at the 7” Of Pleasure Tour at Babylon. January 19: Road warriors The Rural Alberta Advantage play Ritual Nightclub. February 6: Dan Bejar, the musically unpredictable player known as Destroyer, plays the St. Alban’s Church. February 7: The Balconies play Ritual shortly after the January 28 release of their new album Fast Motions. February 7: Two acts with a love of melodic rock will gather at the Shenkman Arts Centre. See radio-rock darlings The Goodluck Assembly with Laurent Bourque at the east-end arts hub. 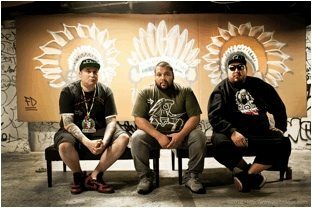 February 8: A Tribe Called Red are on a cross-country tour. They’ll stop at Babylon, the place where they kicked off their Electric Pow Wow club nights, next month. February 14: ‘90s rockers Rusty will be your sweetheart at Zaphod’s tonight. February 15: Songwriter Kalle Mattson will release his new album, Someday the Moon Will Be Gold” at Zaphod’s. February 18: The Hidden Cameras’ new album is called Age and is being hyped as a coming-of-age album now that composer Joel Gibb has found his lot in life. He currently divides his time between Toronto and the cultural capital of Berlin. The Hidden Cameras play Zaphod’s. February 27: Scott Ian of metal icons Anthrax pulls a Henry Rollins and embarks on a speaking tour called “Speaking Words,” because “spoken word” is too darn pretentious sounding for him. The show is essentially an oral biography of Ian’s 30-plus years in the music biz. Ritual Nightclub. February 28: The Jerry Cans promise to bust stereotypes about the North. The Iqaluit quintet meld country, throat-singing, and blues music with lyrics about life in Nunavut. Zaphod’s. March 8: Sam Cash has musical pedigree. His pop is Andrew Cash of The Cash Brothers — now an MP. Cash Jr. straddles rock and pop with his band The Romantic Dogs. They play Zaphod’s just before March Break. March 13: Ottawa blues buddies MonkeyJunk will open the show when Cheap Trick, those ‘70s rockers, play the couth, cloth-seated Southam Hall at the National Arts Centre. March 21: O-town icons The Cooper Brothers will celebrate forty years since their first single was released. They’ll play some of their old hits at Centrepointe Theatre. March 23: Proggy-groove dudes Bend Sinister hit Raw Sugar Cafe. March 27: Seattle Sub Pop Records band The Head and the Heart are precisely what opening act Basia Bulat sings about. See both acts at the Bronson Centre. April 2: Buzz band Mounties is a hot trio. It’s Hawksley Workman, Steve Bays of Hot Hot Heat, and Ryan Dahle of Limblifter and Age of Electric together at their idiosyncratic best. They play Maverick’s with The Zolas.